Santos are set to bring in the ex-Albiceleste boss. JORGE SAMPAOLI HAS reached an agreement with Santos to become their new manager, the Brazilian club confirmed on Thursday. In the announcement, Santos said that while a deal had been reached with the former Argentina and Chile boss, the final details must still be worked out. Should everything go according to plan, Sampaoli will sign the deal after meeting face-to-face with Santos this weekend. Sampaoli has been unemployed since managing Argentina at the 2018 World Cup. The 58-year-old took over the Albiceleste in May 2017 and guided them during a turbulent qualifying cycle that saw the nation nearly miss out on Russia, with a Lionel Messi hat-trick against Ecuador on the final day of qualifying required to get them to the World Cup. In Russia, Argentina struggled to a draw against Iceland and a heavy defeat to Croatia before narrowly securing passage out of the group stage with a victory against Nigeria amid reported strife between Sampaoli and many of his players. Sampaoli would see his side knocked out to eventual champions France by a 4-3 scoreline in the round of 16, with the manager leaving his post by mutual consent following their elimination. Sampaoli had much greater success overseeing Chile, leading them from 2012 to 2016. He managed them to a round of 16 appearance in the 2014 World Cup in Brazil, and followed that up with the nation’s first-ever Copa America title in 2015. 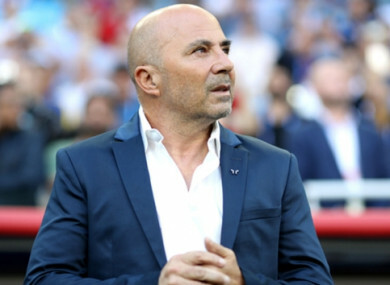 At club level, Sampaoli has managed numerous sides in Argentina, Ecuador, Chile and Peru, including winning three league titles and a Copa Sudamerica with Universidad de Chile. He also enjoyed a season in charge of La Liga side Sevilla, guiding them to a fourth-place finish before departing to lead Argentina. Sampaoli had reportedly been among the candidates to take over Major League Soccer champions Atlanta United following the departure of Tata Martino. Reports also linked Sampaoli to the China national team. Email “Months after his Argentina stint ended disastrously, Jorge Sampaoli is back in management”. Feedback on “Months after his Argentina stint ended disastrously, Jorge Sampaoli is back in management”.